It happens to each of us at one point or another in our collecting: someone sends you something that is related to the team/player you collect but isn't a card. I have lots of things that are Indians related yet have nothing to do with my Tribecards collection. I considered fighting it at first, but then realized that was just a waste of time and generally led to inadvertently hurting someone's feelings. So, I have a slew of non-card Indians items. Bobble heads are such things. I don't really remember how I came about my first Indians bobbler. I can only assume it was sent to me by one of my friends, most likely in the hobby world. I know that Jack (Baseball Dad) has managed to wrangle at least a couple of these from giveaways at Tribe games. Gaylord Perry in celebration of Progressive's 75th year. Bob Feller commemorative statue - Okay, not really a bobble, but belongs here anyway. These little guys watch over me from the top shelf above my computer desk where I do most of my blogging, gaming, writing, editing, collecting... You get the idea. 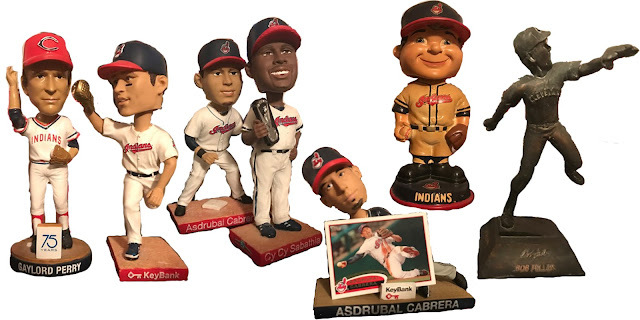 I've never had a desire to complete the set of Indians bobble heads, though I suppose that little itch (you know, the one that makes you buy packs to feed your addiction) will come to me one day. And in those moments, I will tear out to sites like eBay in search of nodding little fellas waiting to join their friends here. One of these days I will send you the one bobblehead I have for you. It will be a nice addition to your collection. Wow, I didn't know you snagged one for me. How cool! Thank you!! Oh yes! One of these days I will be able to get in the mail for you.